The leaves have fallen of the trees, the air is colder, the rooftops and the ground are covered with frost. It is only 4pm, but it’s already dark outside. As an international student, I was worried about winter in the Norwegian capital. So, I asked my Norwegian friends to give me some advice to survive winter in Oslo. 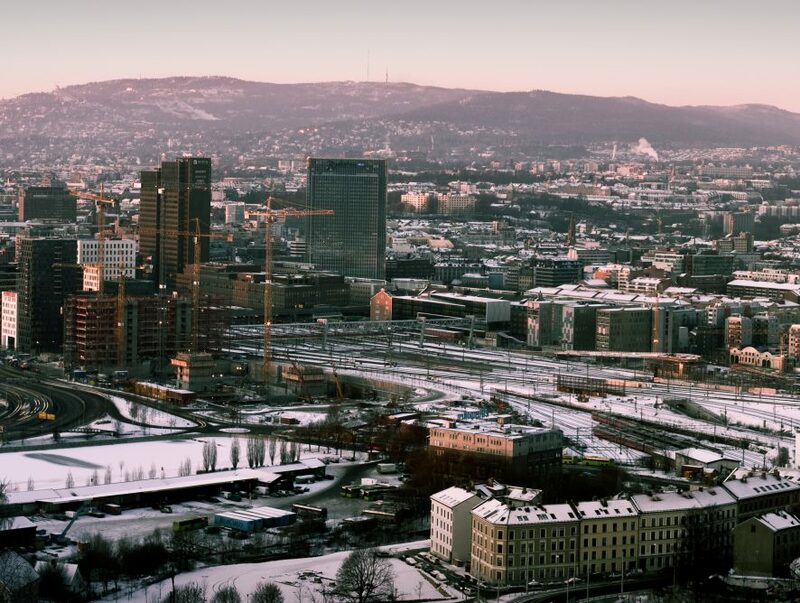 What are your favorite things to do during winter in Oslo? Cross country skiing is the favorite winter activity of my friend Denise. She suggested taking the metro, line 1 to Frogneseteren, skiing to Sognsvann where you can take the metro back home. She also likes ice bathing at the Tjuvholmen pier near Aker Brygge. Eating a kanelbolle with a hot chocolate or coffee is also great if you prefer being inside. If you want to go to the city center, Asli suggested walking down Karl Johans gate, one of Oslo’s main streets. It is very nice because the street is full of lights, people and Christmas decorations. If like my friend Anna you are more of a nature type person, walking in the parks can also be really enjoyable. But one of the best thing to do is going ice skating in Spikersuppa, the skating rink near the National theater. What outdoor or indoor activities would you recommend for the most authentic winter experience in Norway? Skiing is obviously a very popular activity in Norway. You can go cross country skiing in the abundant forest areas surrounding Oslo that are accessible by the metro. Alsi suggests the Tryvann Ski Resort, accessible with the metro line 1. But, as Anna told me, to go skiing like a true Norwegian, you take breaks while eating Kvikk Lunsj, the Norwegian Kit Kat. Snowboarding, ice skating, sledding or even simply walking in the forest are all great outdoor activities. Denise suggests sledging down Korketrekkeren, where you can rent a sledge or bring your own. Then when you are hungry, my friend Naol suggest to eat barbeque and drink a lot of hot chocolate. If you feel cold, Denise told me about a sauna boat at Sørenga pier not too far from the Opera House. If you’d rather stay inside, Anna advised playing board games with friends while drinking (again) hot chocolate or solbærtoddy, a hot drink made of blackcurrant juice, sugar and hot water. How do you overcome the harsh weather? All my friends said that wearing good, thick clothes is the key. Dressing fashionably is not the priority: if you don’t want to be freezing, dress to be warm. Wearing layers is important. Dressing starts with insulating underwear; my friends advise wool. A warm jacket is a must, but so is a beanie, a scarf and gloves. Then for the shoes, wear warm winter shoes that have good grip on the slippery ice. And don’t forget to bring an umbrella if you don’t want to be wet or covered with snow! To warm yourself up after going out, a sauna is always nice. You might also want to take care of your skin by using a lot of body lotion. Indeed, the cold temperatures will affect your skin and potentially make it very dry. How do you fight depression caused by the lack of daylight? According Anna, being around people and socializing is crucial, as isolation will only worsen a depression. She also advises including something nice every day like a good meal, watching a movie or going out for a walk. Thus, you will have something to look forward to. If like Asli you love the time of Christmas, then listening to Christmas songs can make you happier. The lack of daylight doesn’t only make you depressed, it also tires you. To compensate this, Naol suggests simulating daylight thanks to a bedside lamp that automatically turns on at the time you want to wake up. It is possible to buy it at Clas Ohlson or on Amazon. He also recommends physical exercise to curb the feeling of tiredness. I hope you now feel better about winter in Oslo and see that there are plenty of things to do if you dress properly. So, enjoy the winter whether you are an experienced Norwegian or an exchange student spending your first winter in this cold country.